IPL 2019: CSK cements its position as table toppers with 14 points. IPL 2019: It has to be the cutest picture on the internet today. 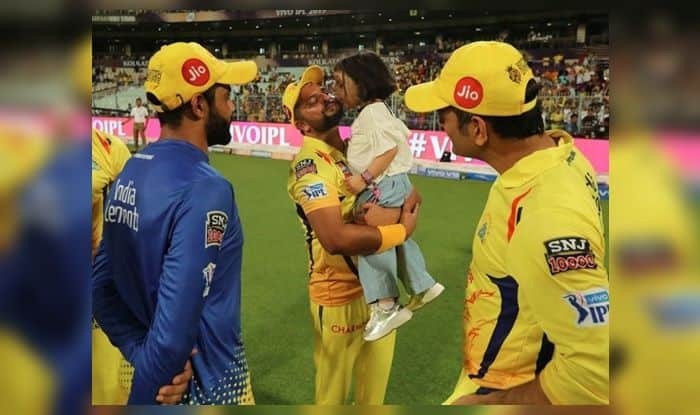 MS Dhoni’s daughter kissing Suresh Raina after CSK beat KKR by five wickets at Eden Gardens will melt your heart. Ziva is no stranger to visiting grounds, cameras, and all the adulation. One has to agree that the little munchkin handles it well. Ziva is very close to Raina’s daughter Gracia, the two have been spotted in the past together playing in the CSK dugout itself. சின்னதல க்கு டோணி யின் மகள் குடுத்த முத்தம் . Meanwhile, Imran Tahir and Suresh Raina helped Chennai Super Kings (CSK) put one foot in the playoffs as they got past Kolkata Knight Riders (KKR) by five wickets in their Indian Premier League (IPL) return leg fixture at the Eden Gardens here on Sunday.